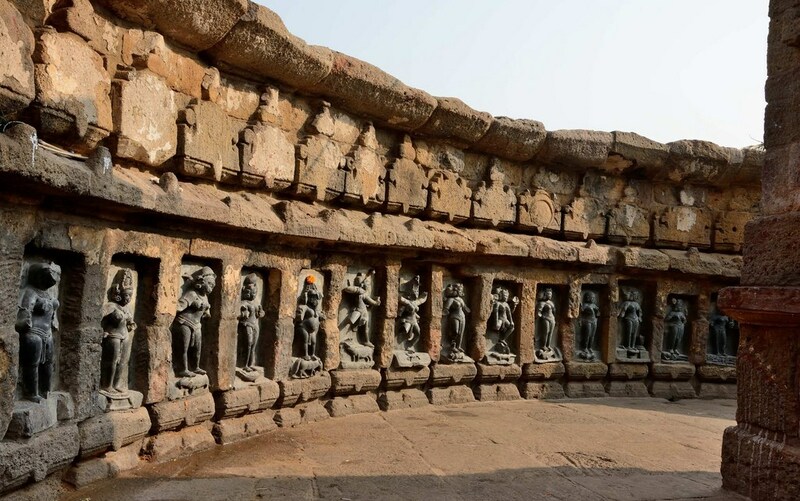 The focus of the present article is on the amazing hairstyles displayed by 64 yoginis in the Chausath Yogini temple of Hirapur, near Bhubaneswar in Odisha that I visited in January this year. But before coming to the hairstyles, I need to acknowledge that I have been following the travel blog of an extraordinary blogger (http://www.frommywindowseat.com/-) Ms. Ragini Puri. She does not write about the usual touristy places. She visits out of the way, little known places and writes about those in an investigative way. I read her blogs about Odisha. Having worked in Odisha for over three and a half decades I could relate to the places visited by her. But when she wrote about the Chausath Yogini temple at Hirapur near Bhubaneswar, I felt embarassed as I did not know about the existence of this extraordinary temple dating back from 6th to 9th century AD. So let me say a big Thank Your to Ms. Puri, whom I have not yet had the privilege of meeting. A brief mention about the cult of Chausath Yoginis needs to be made here. There was an active cult of dakinis usually called yoginis from the ninth (one view is the sixth) through at least to the thirteenth centuries. 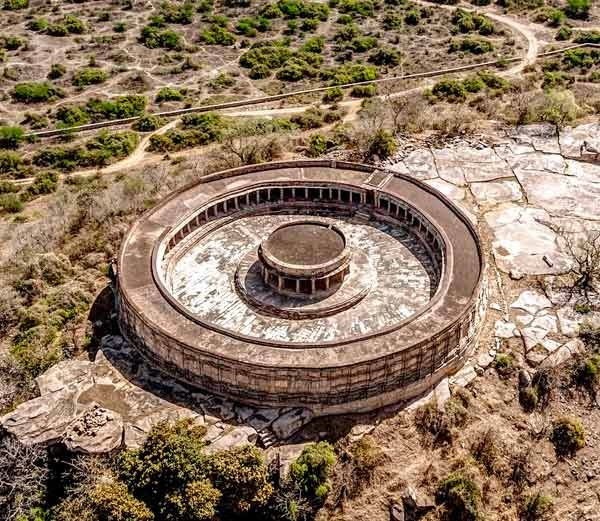 Nine yogini temples have been discovered so far. 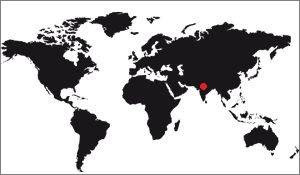 The best known are the two in the state of Orissa (Ranipur Jharial & Hirapur) and the one each in Madhya Pradesh, Uttar Pradesh and Tamil Nadu. Ranipur Jharial, located in the Bolangir district of Odisha, is said to be mentioned as "Soma Tirtha" in scriptures. It combines a section of religious faiths like Shaivism, Buddhism, Vaisnavism and Tantrism. I visited it long back in 1970. 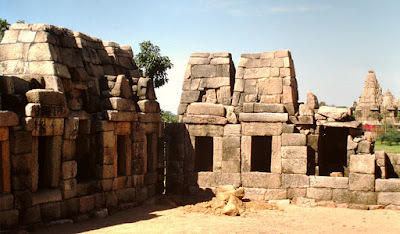 Chausath Yogini Temple, Khajuraho. It is in a rectangular while all others are in circular shapes. Photo source: Wikimedia commons. 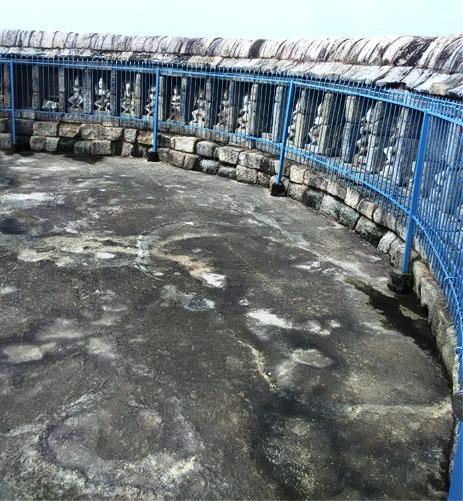 Now one comes to the Chusath Yogini Temple at Hirapur near Bhubaneswar. It is a hypaethral (without roof) temple.It is in excellent condition and some puja is also performed here. Ofcourse a good number of the statues have broken arms or other parts but what is available makes one wonder at the sheer mastery of the sculptors of Odisha of the yore. The temple is believed to have been built by Queen Hiradevi of Bramha dynasty during 9th century. It is built in a circular fashion, with blocks of sand stone. 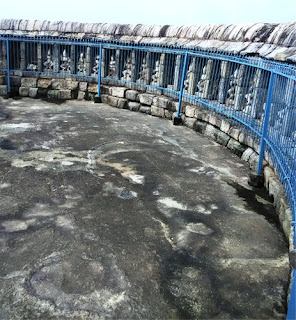 The inside of the circular wall has cavities, each housing the statue of a Goddess. The are idols, made of black granite, are placed within the wall cavities. In the middle is the Goddess Kali who stands on a human head representing the triumph of the heart over the mind. The temple houses a central altar (Chandi Mandapa) which has the remaining 8 Goddess idols on all 4 sides.The legend behind the temple is said to be that Goddess took the form of 64 demi-goddesses in order to defeat a demon.The Jogini idols are generally representing a female figurine standing on an animal, a demon or a human head depicting the victory of Shakti (Feminine power). Though each yogini statue sports a different and highly elaborate hairstyle, three main ornaments worn by each are similar- the one worn around the head and forehead, the necklace with a sort of pendant and the ornamental chain worn around the waist. This yogini is the four armed Ajitha. Her upward going hair looks as if it represents a flame. The ornaments on her head are different from the ornaments of other yoginis. This is yogini Vayu Veena. Her hair is braided on the right side of her head. The huge ear rings worn by her are called Kapa. She is seen standing on a stag. Notice how the ornament worn around the waist suggests movement. It is not straight but slightly bent as the movement is taking place. What detail! What superb mastery by the sculptor! This yogini with an intricate cap like hair style,where the hair is combed up on the head and braided in two directions is Chandika or Maya. This is Narmada. Her hair is braided on the right side and she is shown as holding a kapala or skull cup from which she is drinking blood. This is the Yamuna. Her hair is seen as curling upwards. This yogini is called Bindhiya Basini or Vrishabhanana. Her face appears to be that of a buffalo. The disheveled hair is called Jatamandal. Two armed boar faced with raised hairstyle is Bhalluka. This hairstyle is known as Jata-Mandala. She is holding a damru in her right hand.